The National Trust has launched an urgent £2.6 million appeal to preserve and ensure public access to a beautiful stretch of the south Devon coastline. 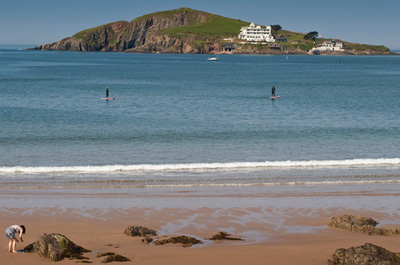 Bantham Beach and the Avon Estuary are part of the Bantham estate, which is for sale, with a harbour, 18-hole golf course and 21 cottages-in essence, a village- plus a car park and a private road to the beach, for £11.5 million. The Trust, which is not aiming to buy the cottages, will use £4.6 million from its Neptune Coastline Campaign, set up in 1965 to raise funds to protect coastal areas. It already looks after 742 miles of coastline, most recently raising £1.2 million to buy a one-mile stretch of the White Cliffs of Dover. To donate, telephone 0344 800 1895, text BANT14 plus the amount you wish to donate to 70070, post a cheque to National Trust, Supporter Services Centre, National Trust, PO Box 574, Manvers, Rotherham S63 3FH, or visit www.nationaltrust.org.uk/lovebantham.